June 23: I ate Lucky Charms for breakfast, and Shang-hi harassed me about that. "Yeah, the options in Independence were severely limited," I told him. I had to admit, though, it did taste good. =) I had doubts it would fill me up, though. Hurricane and Shang-hi woke early and left camp before me. As I was finishing up and about ready to leave, two young girls walked past camp. They reminded me vaguely of the two girls I saw walking up Kearsarge Pass when I was hiking down naked, but that couldn't possibly be right. That was two days ago. It seemed impossible that I caught up to them so quickly. "So who are you?" I asked. And indeed, it was Fidget and Anne, the first two people who had caught me hiking naked. It seemed clear that they didn't recognize me with my clothes on, and I nervously introduced myself again. "I'm Green Tortuga." Anne exclaimed, "Oh! We saw your wee-wee!" Wee-wee? Really? That's not a word that inspires confidence. I learned that Anne was just visiting Fidget for a short section of the trail, and that they decided to take a zero day directly on the trail which is how I was able to catch up to them so quickly out of town. We talked about Hike Naked Day, and Fidget and Anne said that they really wanted to try it as well, and after meeting me, they spent all day talking each other out of it. Fidget called my naked hiking "honorable"--admittedly not the first word that comes to mind when I see a naked hiker, but I wasn't going to complain. Yes, what I did was honorable! I pulled ahead of the two girls, eventually catching up to Shang-hi and Hurricane a few miles before Pinchot Pass, a 12,150-foot pass. It was a pass I had heard nothing about, which made me optimistic that it wouldn't be much of a problem. Even my topo maps suggested it would be relatively easy, slowly climbing in altitude without any steep cliffs to slide down. But I was wrong. We were all wrong. It was the worst pass to date. It wasn't a dangerous pass--the trail didn't go along the steep, scary-looking slopes. The problem with this pass was postholing. The snow was thick and soft, and with each step, I'd sink in up to my waist and have to dig myself out. Each exhausting step increased my frustration. I wanted to yell. I wanted to cry. I fell to my knees and started crawling at one point. The increased surface area of my body while crawling helped reduce the postholing problems (the keyword being reduced the problems--not eliminate them). I tried to follow the official PCT trail to the top of Pinchot Pass while Hurricane and Shang-hi veered off and went up the right side of the valley where they felt the snow wasn't as deep. They were probably right in hindsight, but the official PCT looked like it might hit a lot of the rocky outcrops on the left side of the valley so I stuck with that. But the postholing was a nightmare, literally bringing me to my knees. For about ten minutes, I crawled across the snow, repeating to myself, "Please don't break through... please don't break through the snow....." over and over again. Sometimes one of my hands did break through, and my face would crash into the snow, my hands and arms buried in snow. I'm not proud to admit it, but I did a lot of cussing. At one snow-free rock outcropping I reached, I finally stood up and saw the trail. I could actually see the trail, after losing it over an hour before, and I shouted down to Shangi-hi and Hurricane, "I found the trail!" The two were small specks at the bottom of the valley, and I heard them call back, but I couldn't make out their words. Then I heard another voice--a girl's voice--also call out from the bottom. There was a third hiker down there, but I couldn't identify who it was. The only two girls I knew about on the trail was Fidget and Anne, but they were ahead of me, and there was only one girl below. I wondered who it was, and shouted out, "Who is that?" But I couldn't hear an answer. I postholed again, using my trekking pole to help push myself out, when SNAP! My trekking pole broke in two. I cursed it and proceeded to dig myself out with the half pole now in my hands. Near the top of the pass, I finally connected with Shangi-hi and Hurricane again, and the mysterious girl who followed their route was Fidget. I'm not sure how I got ahead of Fidget, and I didn't know what happened to Anne. Shangi-hi said it looked like I had a lot of trouble with postholing on my route, which I confirmed, and told about my having to crawl across the snow at one point. "Yeah! I saw that!" He wasn't sure if I had just postholed and was trying to dig myself out or if I was actually crawling across the snow. "Oh, I was crawling. Definitely crawling." To Fidget, I asked, "What happened to Anne?" After climbing over Glen Pass, Anne decided that this trail was too scary, too intense, and too insane to continue. She quit. Probably thinking something like, "You thru-hikers are f#*@ing INSANE!" I didn't realize that there was even an option to quit somewhere along this part of the trail, but I guess there was. So Fidget was now hiking alone, or at least following us up Pinchot Pass. From the top of the pass, Fidget and I hiked on together. While I did want a hiking partner over these high passes, I kind of didn't want to hike with Hurricane. Not that I didn't like Hurricane, but from past experience over Fuller Ridge, I knew he got lost often and easily, and he was also having knee troubles, and Shang-hi had told me that Hurricane was saying he wasn't sure if he would even be able to finish the trail. I didn't want to attach my ship to a guy who might leave the trail at any time and who would be next to worthless trying to navigate. So I attached my ship to Fidget. It wasn't really a formal agreement or anything, but rather the two of us just took off from the top of Pinchot Pass at around the same time, and both of us continued to posthole for miles more on the other side of the pass slowing us down to similar paces. We'd call out to each other anytime either of us spotted the trail peeking out from the snow. Progress through the snow continued to be slow and exhausting. Eventually, we passed a park ranger--the second one I'd seen in as many days--who encouraged us that the snow would start going away after another mile or two. 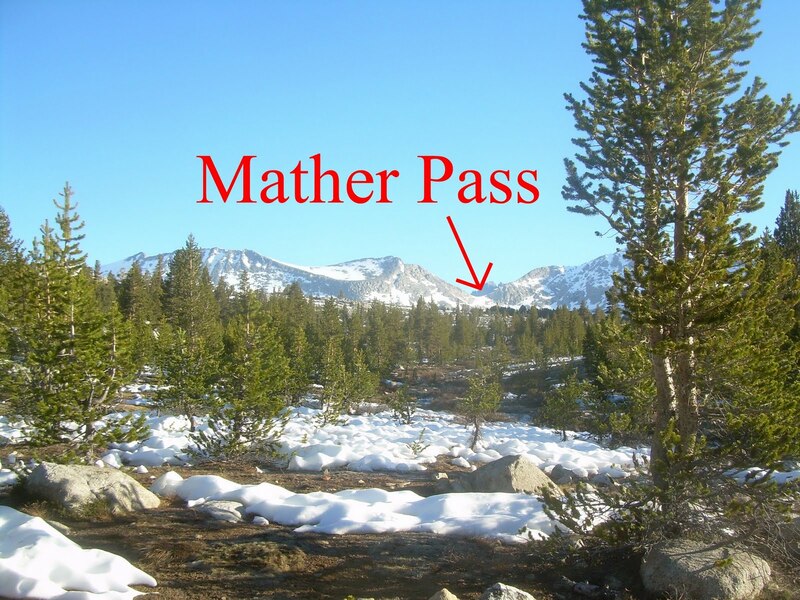 He also pointed out Mather Pass, the next 12,000+ foot pass that we would have to cross the next day. The actual pass we typically don't see until the very last minute due to the bends and curves of the canyons, but Mather Pass was visible from a long way off. And it didn't look too bad at all. The ranger said the snow level looked like it only covered the top 1000 feet of the pass, and that it was a lot easier than the pass we just crossed over. This lifted our spirits immensely! We eventually got out of the bulk of the snow. The snow never really left completely--patches of it still lingered on the trail--but the postholing finally came to an end and more of the trail was exposed than covered and we went down the mountain. We crossed a couple of knee-deep, fast-moving streams, and Fidget offered me one of her trekking poles to help me keep my balance while crossing, which was very helpful. Then we reached the South Fork of the Kings River--a raging wall of water. Crossing it looked positively suicidal. It was the first of the truly scary river crossings. The ranger had said there was a river crossing ahead, but that it could be crossed on a log upstream from the trail. We didn't fully appreciate the danger this river crossing involved when he mentioned it, however. We hadn't seen anything like this on the trail before. We hiked upstream, looking for the log that could get us across safely. We finally found it, but the river had risen so high, it was now streaming over the log. And even then, the log only crossed the second half of the river. It was sketchy, no matter how we looked at it. Fidget seemed fearless, though, and all but jumped into the water to get across while I was still 'waterproofing' my gear. Knowing that there was a very good chance my gear would get wet, I put my camera in a Ziplock bag, inside a second waterproof bag, deep in my pack. I protected my maps, wallet, and electronic devices similarly. Fidget had nearly made it to the other side before I was even ready to start the crossing. I stepped tentatively into the water--ice cold water, freshly melted snow--and the water became waist deep within seconds. A log in water, just out of reach, tantalized me, and I tried to reach for it. I reached, I grabbed, and the small log shifted, throwing me off balance. I was about to be swept away. I was sure I was a split second from being swept away, but somehow I grabbed onto the root of a nearby tree and steadied myself, pulling myself out of the water and standing on dry ground in the middle of the river, heart thumping so loudly it drowned out the sound of the rushing water. I looked up at Fidget, watching me from the far side of the river, and gave her a thumbs up. I was okay. For now, at least. There was still the other half of the river to contend with. She urged me to cross on the submerged log. I worried about crossing on a submerged log. It was wet, with fast moving water flowing over it, and I worried my feet would slip if I tried to cross on it. But Fidget crossed okay, and she shouted to me that it wasn't as bad as it looked, so I went for it--another hair-raising, adrenaline-packed crossing. I crossed successfully, however, and felt like throwing up upon reaching the other side. A river crossing like that will sap any energy left in a guy, let me tell you. We continued hiking, and I told her, "The trail is bad and I felt half mad, but I swore I would not give in!" She thought a moment, and asked, "Is that from The Cremation of Sam McGee?" Well, yes, it was. I was impressed that she could pick out such an obscure line from a poem that most people aren't familiar with. Seems that her dad used to read her that poem all the time as a child, though, and she still recognized it. Fidget and I continued hiking, pushing as close to the snow level as possible. After the postholing misery of today, we both wanted to get up and over Mather Pass as early in the morning as possible when the snow was still frozen and postholing not likely. 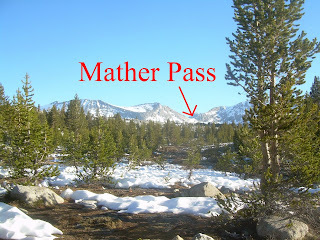 So we were both incredibly exhausted, but we pushed on a few more miles, getting as close to Mather Pass as possible. We finally set up camp, on dry ground, surrounded by snow. Fidget commented that I have an usual way of carrying a trekking pole, describing it was "Willie-Wonka-ish." I hadn't ever considered how I held a trekking pole before, but I instantly knew what she meant. I'd hold it with an 'overhand' grip, let it swing freely, and it's not the kind of grip I've ever seen other hikers use. They hold trekking poles in the 'standard' mode, gripping the handles as they were designed to be gripped. Setting up camp, she also commented that she considered this part a 'feminine' activity. Part of the 'nesting' syndrome. Making a home, even if it was only to be used for a single night. I always visualized it as a manly activity, taming the wilderness. Survival. Tough as nails. In camp, I always changed into dry camp clothes, and I joked that I guess it didn't matter if I changed clothes in front of Fidget since she'd already seen me naked before. Save me the effort of having to find some place to be modest in my changing, at least, which is kind of a hassle anyhow. There weren't a lot of trees in the area where we camped. Is that a Leki that you broke? My brother has gone through something like a dozen of them, all replaced free under their lifetime warranty. Do people ever bring snowshoes along? Anyhow, I think these photos are the most amazing yet on your trek. That first one looks positively fake it's so perfect. I have to agree, these photos are your best so far AND amazing! aw a news report that PCT is closed near Mt Hood due to wildfires. Hope it doesn't affect you! Ryan, your stories are amazing -- though with August nearly finished, I find it difficult that I'm reading about late June... it may be December before we finish reading about your adventures! Nevertheless, what a privilege to get to read about them, so thank you! Interesting how you both saw the making of camp so different. Mars and Venus...and all that jazz. I hold my poles the traditional way, too. Your way is more like holding a cane. They sell trekking poles built for cane-like hand-holds yours. That river looked raging! Good thing the day was warm and you crossed it earlier in the day or you could have ended up with hypothermia. I agree those photos are incredible. But I have a feeling it's impossible for anyone to take a bad photo with scenery like that.